Did you know? Christopher Columbus' flagship, the Santa Maria, sunk somewhere between the bay of Caracol and the bord de mer de Limonade. Caracol is likely to be the original village (hometown) of Guacanagaric, one of five Caciques (native chiefs) of Hispaniola. Guacanagaric who was friendly to Columbus, told him there was gold in the Island (big mistake) and allowed him to establish the settlement of La Navidad near his village. 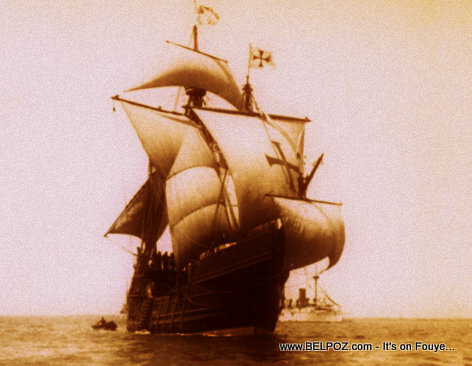 La Navidad then officially became the first Spanish settlement in the New World, built from the shipwreck of La Santa Maria. So where does Caonabo fit in to this story? Well... When Columbus return to the New World, he expected to find a flourishing fort La Navidad. But instead, what he found were dead men and a settlement burnt to the ground. All of these things, and more, happened back in 1492 in the area of that is now Caracol Haiti. Actually Ayiti is the Taino name for the island. It's then clear that the indigenous Taino are properly Ayisien. "Haitian" is simply a Latinization of the word *Ayisien". Oh, Lord!!! Please know about what you write! This is an offense to History. "This first Haitian Taino to revolt against the Spanish which destroyed La Navidad was led by Caonabo, Cacique de la Maguana..." Hatian? He was indian...Haiti was not stablished yet, and as you MAY know Haiti is pure African descent.